Coming off of a nail-biting week four (see results below) we have quite the early slate to dissect. There are a lot of high-powered offenses kicking off early with some game totals reaching almost 90 (Bay/TxTc)! Sadly, most of the players in that game appear to be priced fairly but there is still value to be found. At QB this week I’m rolling out Gary Ward, Jr. He’s a dual threat QB in a game with an O/U of 80.5 and Houston has a team total of 43.5. He comes with a hefty price tag but with so many high-powered offenses playing in this slate you can’t afford to miss at QB. He’s accurate, has a high floor, and is coming off of a 48 point outing. He’s as good as they come for fantasy. In order to get an extra $300 I went down to Baker Mayfield. I believe he will throw for over 300 yards and a couple TDs so I’m not worried and now I can upgrade to Jakeem Grant at WR. Matt Dayes will be RB#1 and he’s a great value pick. Not only is he facing a Louisville defense that gives up 4.5 yards per attempt, Dayes should be getting all this look this week. He was already getting a majority of touches but the player he was sharing with, Shadrach Thorton, was kicked off the team this week. He should get all the work he could want. Aaron Green needs no real explanation. TCU is coming off of an emotionally high win but they should be up again to face Texas. After being snubbed for so long in the State, TCU loves nothing more than pounding the Longhorns. Texas gives up 4.2 yard per attempt and Green is a monster. TCU is a heavy favorite (-14.5) with an O/U of 71. Green should have ample opportunities to rack up yards against a bad Texas team. He has back to back 30 point outings and I think he increases his streak to three straight games. 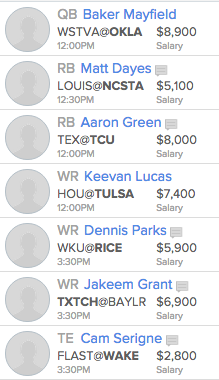 My #1 WR this week is Keevan Lucas. He’s still not priced like the top WR in college football (and he probably is). He should be in a shootout and the Tulsa offense is as high-powered and fast as they come. He is a top target on the team and gets looks near the end zone. Dennis Parks is my WR#2 and although his price has come up he’s still a value at $5900. He is the #1 target in the offense and should have no problem reaching value in a game that is expected to see both teams score 30 points. At the moment, Westerkamp is my WR#3. Nebraska should be able to move the ball against Illinois and they have a team total of almost 30 points. Jordan is their #1 WR target, averaging almost 7 catches per game and 19 fantasy points. With my new extra $300 I upgrade to Jakeem Grant. 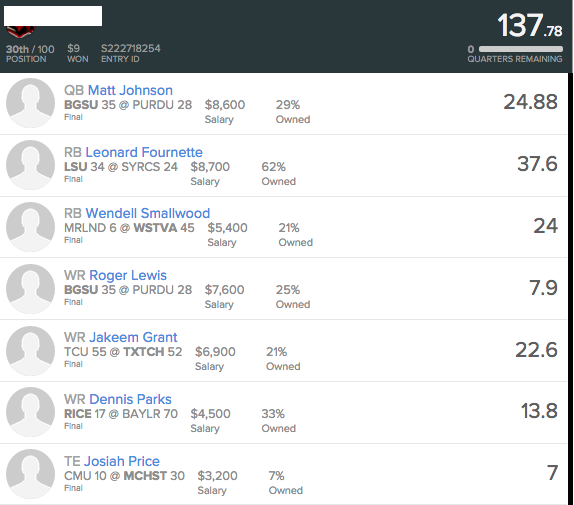 I got a piece of that TT/Baylor game now which should be high scoring and Grant is the best WR for the Raiders (imo). He could be in line for a HUGE game playing catch up. As usual, I look for cheap options at TE. Higbee is the obvious choice here if you’re willing to pay up but I didn’t love any LUs I came up with that used him. I instead went for Cam Sergine. He has a tough matchup but he gets looks in the offense and I expect him to get some catches and he should reach value. He hasn’t quite played to the level of his freshmen campaign but for $2800 it won’t take much for him to be worth the price; plus it allows for a few studs elsewhere in the lineup.